Bike has never been dropped. Any ideas on how and why this happened? Torqued that bolt down to hard. Why does it look scabby round the bottom of the bolt. Looks repainted and didn't wait for it to dry. Yup! I'd say repainted and bolt too tight. It will crack plastic every time. If I don't know the torque specs on something as a rule I only go 1/4 turn past finger tight and check it often. Some Loctite wouldn't hurt either. Going to bring it in to the dealer this weekend. Should be under warranty. I only bought the bike a week ago. I would bring it today but it's nice out and I want to enjoy my last few days of riding. If you look closely at the plastic between the bottom of the pict and that bolt, there are raised bubbles in the surface of the plastic. Wonder if brake fluid was spilled on that plastic? It's hard to tell what's wrong with the paint from the picture but if you lose the plastic washer, that bolt will chew up the paint in that area too. are those plastic bits actually painted or is the color in the plastic and the surface just glossy? But yeah, those are the only bolts holding those trim bits that have that clear plastic washer and they are sure easy to drop and play hide and seek. it as though it as had a reaction to repainting. Rick you were spot on. Crack kept growing so I went to the dealer today. Brake line was loose and dripped brake fluid onto the panel and into the area with the bolt. Yamaha notified and approved work under warranty. Question though, is brake fluid that corrosive that it would eat through the panel and cause it to crack? 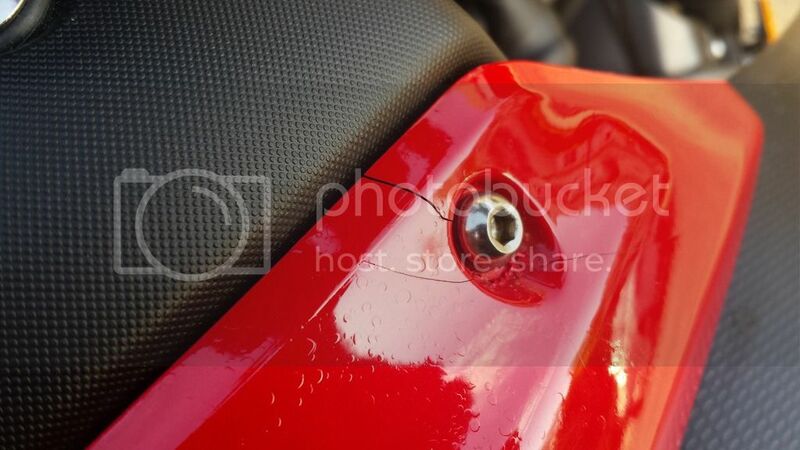 No, crack is from over-tightening and/or lack of plastic washer under bolt. Brake fluid is really mean to paint and some plastics. All those blisters and that dissolved area right around the bolt are the result. It might have even dissolved the plastic washer that's suppose to be under the head of that cap screw. I guess it's possible that the brake fluid caused the plastic to swell or soften and Vibration caused it to crack. That's kinda reaching, but I'd like to think it wasn't from someone going simian on that little screw and way over-tightened it. It's just a pice of trim after all. Yer never gonna know what the order of events was. I don't go near the brake master or clutch (if there is one) on a bike w/o covering the tank, instruments, windscreen and anything that could get dripped/splashed with that stuff. And then, in case all those unfolded plastic garbage bags aren't enough, I'll have a bucket of water and sponge at the ready. I think if i spilled brake fluid on a 70s vintage Chevelle SS, I might just get a bit sick. Brake fluid is a somewhat unpleasant chemical for a host of plastics ( including paint most of which are gonna be plastics). Even if it dosent dissolve it can change the nature ( I'll leave the word at that) of the plastic and change it. Including from malleable to brittle. As a rule brake fluid and just about anything don't mix ( DOT 5 and mineral oil fluids not included). unfortunately for brake components, DOTs 3,4 and 5.1 mix quite nicely with water. And that's why it's important to change them often. But they sure can ruin your day if spilled on the wrong spot.